Im thinking thats why the thermostat is broken. Even with the proper temperature its not opening which is why the water is forced out the resevoir. Heat is supposed to open it, but its not even when the temperature is up, I drive it and the fluid comes out causing my engine to overheat. If I turn the heater on the temp drops to normal, it didnt overheat until the fluid spilled out. "...the fluid comes out causing my engine to overheat....it didnt overheat until the fluid spilled out "
"...my engine overheats causing the fluid to come out ....the fluid didnt spill out until it overheats "
sorry for the typo there. I didnt mean to confuse anyone. So I put on a new thermostat. (had some trouble with the housing due to steel screws in aluminum holes) but once everything was sorted out and new thermostat was in I have been driving and on three seperate occasions nothing has happened. I pray that was it. It was about 9 years old and gone through a couple flush kits with heavy rust, so I think it was time for it to go. But thanks for the help. I was driving home from work and it felt like I hit a big pothole or had a flat. I continued to drive home with no problem. The next morning after driving the car for 1/2 a mile, the wheel jerked and pulled with a metallic noise. I drove the car back home with no problem. We replaced the brake pads and rotors on both front wheels. Also found a burr on right caliper and replaced that. I took the car for a test drive wuth no problem until I was almost home. I was not braking at the time but the front right wheel became bound up and I could not drive over 20mph. I have asked several people what it is. They either say a pinched brake line or a bad wheel bearing. Anyone have any ideas? ,,front bearings are indeed a common cause for concern. raise front of car, check for wheel side play; either the bearings are tight, or thay have some play. Remove vacuum hubs then check spindle nut: you most remove 2 screws for the lock cover, then use some sort of fork tool to turn the spindle nut and check for adjustment. Spindle nut must be torqued just enough to eliminate play, that is,almost just past finger tight; more than than and the bearing will seize. Generally, bearing failure will be accompanied by seal damage and loss of vacuum so the hubs would not operate any more...that is, if you still have the original vacuum hubs. What is the question/problem, exactly ? This winter I have had a problem with a major gas smell when I first start the sportage. I thought is might be the heat sensor making the car run too rich, but I am not sure. When I start the car on cold mornings I will always get the gas smell, but I don't seem to have the problem if it is not cold. The gas smell is bad - even with it cold outside the window has to be opened some to air out. Any suggestions? On two different occasions, the check engine came on and then eventually went back off. Just purchased a new V6 LX Sportage. Planning for a 2500 mile trip this weekend. Got few questions. 1.what is the engine break-in period and the maximum speed limit I should maintain during the break-in? 2.What grade gas should I put? 3.Will Mobile-1 10w-25 Fully Synthetic is good as engine oil? 4.Should I change the Air filter to K & N for better performance? 5.What tire pressure is good? Congrats on the new Sportage! 1. Whatever the manual says for the break-in period. Don't put it on cruise, but vary the speed. 2. Whatever the label on your gas tank flap says. 3. I'd use what the owner's manual says. It probably doesn't say not to use synthetic, but I think it's overkill for the average car. But it's on sale right now at Advance Auto if you gotta have it (if you don't have Advance Auto in your area try Checkers or Kragen). And AutoZone has Quaker State full synthetic on sale right now too. 4. I like OEM paper filters myself. I think they do a better job than the aftermarket ones and I don't believe the hype. 5. Try using the psi recommended on the tire label that should be on your driver's side door pillar. For a little bit better mpg (or if you are hauling a load on your long trip), you could try bumping up the cold psi recommendation up a couple of pounds. If you find the ride a bit harsh, then you could dial it back to the recommended number. We just bought a used 2000 Kia Sportage with 150000 miles and it ran fine for about a month. Now when we go up hills it has no power and we have to downshift to get up even a medium sized hill. Just had the timing belt replaced changed thre spark plugs and boots and the valve cover gasket. And now its worse max speed of 55 mph on flat roads, going downhill when we try to accelerate to get up the next one the engine revs but get no extra speed or power...... Any ideas???? 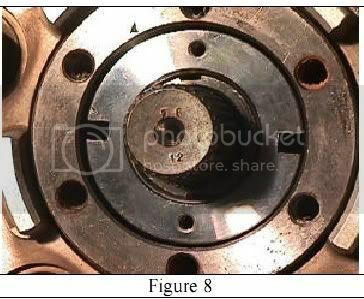 There has been a recent case of broken locking key of the crankshaft timing sprocket. Was that verified when the T_belt was changed? CHeck THIS THREAD out. It appears this is a common issue with Mazda engines (which Sporty is). No we didn't check that but thanks for the heads up. We are going to tear into it again this weekend so I will definatly check that. tore into it again and checked the crankshaft and everything was fine. Now we are just chasing sensors trying to find one thats bad but no luck yet. Pulled the EGR Valve and cleaned it didn't change anything, checked the throdle position sensor and its ok. I guess next would be the Crank position sensor maybe? Any other ideas are welcome Thanks in advance. THe crank position sensor is a go-nogo item. If it runs, this sensor is correct. Hello, I hope someone can direct me in the right way. My wife 2001 Kia sportage engine light came on over 2 months ago and I had the code checked at a local part store. It showed a bad catalytic converter, Since I do not live where emission are required I did not see the reason for a 199.00 catalytic. Well now the car shuts down when driving. The engine light flashes and rpm guage goes to zero rpm and runs off one cyclender. Once you let it sit for 5-10 min it will crank back up and run like normal for a day or two. I had the codes checked again, Bad converter and Misfire on cyc 2,3,4.. This car meets the requirments of CA emissions, So I was told that the computer was shutting down the engine because of a bad converter. So replaced the converter and had the codes cleared.. Ran good for a day and it done the same thing again.. The new converter was rattling after the misfire. took the new converter off and the insides came falling out. Have new converter on order. Should I be looking for something else? before installing the new converter.. Maybe a senor? What you describe is typical of failed crank position sensor, located on clutch/torque converter bellhousing, driver side. A common issue with SPorty.. This is typical of all cars, by the way. Crank sensor is heat sensitive and in most cases starts running haywire when hot, then progressively fails completely. Thank you, I will get one and see what happens.. Will let you know.. I have done the free exhaust test and still misfires and then clears up and back to misfiring again. I replaced the crankshaft pos senor last night, Along with a new catalytic convertor.. It was misfiring when I first started the engine after replacing these two parts and then cleared up after a few seconds. Thought that it was fixed... Drove the car this morning 42 miles with no problem. Went to drive it to lunch and once the engine started it was misfiring. Drove it 1 mile and then it cleared up and ran great.. same codes of misfiring on 2,3,4.. What else could I check? I have a question? Where is the ecm located? I found one box under the dash next to the steering column named Unit-Cont ECAT wt005728 / 954404Z110 (Silver metal small box.. Found another one under the radio mounted to a bracket named ECU-ETWIS - OK07E67720 (Small black plastic box).. Found one under the floor mat on passager side named Control Unit, EGI K07A Cal,Fed 1268301783 (Large silver metal box, This last ne seems to be the one. It has the largest amount of wires then the other ones. I took the exhaust off first when we started having problems. When we rev it up we can't get it over 3000 rpms if we do it pops a code multiple missfires and miss 1,3,4 should i check the injectors??? that might be part of it but it runs fine in 1st thru 3rd, maybe the trannys bad to any Ideas???? ...that lets me think it acts as from the rev limiter....most cars would not let run the engine at high RPM when in neutral or park and it cuts the ignition or injection to a number of cylinders...but all returns to normal if engine is loaded in any of the drive ranges...but then the transmission encoder must tell the computer that it is NOT in neutral....and that directs the attention again to the plugs and witing connected to the transmission...but this is just speculation at this point though. My 99 sportage started idleing rough, eng light came on. I finally got it over to get the codes checked. It was p0301(cyl 1 misfire) Here is what is stumping me, it runs fine when its cold after it warms up it starts to misfire. If I let it cool back down it starts normal. Anyone have any ideas? It is driving me crazy!!!! ..first step is to go for that (and other) spark plug(s)...and specially the wire from the rear coil pack. THis is a very common issue. Did you change spark plugs before?..somewhat annoying because of what you need to remove...but not that difficult. Check for oil contamination in plug #4....in which case you would also have to remove the cam cover and change gasket....also a common issue. Hi everyone! I'm new and I have three questions and will post them separately. First, the reserve tank on my radiator empties very quickly and when it's empty it causes smoke to come out from under the hood. I really don't know what is causing it to empty so quickly which causes it to over heat. I'm heading to Florida Thursday and need to resolve it quickly and cheaply! This question pertains to when we ran the AC on the way to Florida in December the passenger floor board was saturated with water. I need to know what can cause this and possibly how to inexpensively fix it!